Vegan Stuffing Muffins with onions, celery and cranberries are glued together with apple butter! Easy make ahead recipe with just 6 ingredients that can be made gluten-free. Perfect for a stress-less Thanksgiving or Christmas holiday dinner. Kidding aside, stuffing can be a source of much debate at holiday dinners. Everyone has their favorite ingredients and methods that have been passed down through the years. Some families like day old or toasted bread. Others don’t want bread at all. So it’s with trepidation that I’ve dabbled with our tradition, making Farro Pilaf with Cranberries and Walnuts and now these stuffin’ muffins. I always make a traditional stuffing recipe too. But, I definitely make ahead several batches of these cute little muffins too while most of the ingredients are out. They are egg-free and dairy-free and loved by everyone! Apple butter is one important ingredient that you generally won’t associate with stuffing (although apples definitely are!) It happens to be the “glue” that holds everything together. Make a batch of our Low Sugar Crock Pot Apple Butter or buy a jar at the store. You won’t regret it! There are just 6 ingredients and NO stove-top preparation required for this recipe. They are naturally vegan and gluten-free if you use the proper bread. STEP 1 Generously grease muffin tin wells with vegan butter. It helps form the outer crust and the stuffing muffins will pop right out when they are done. 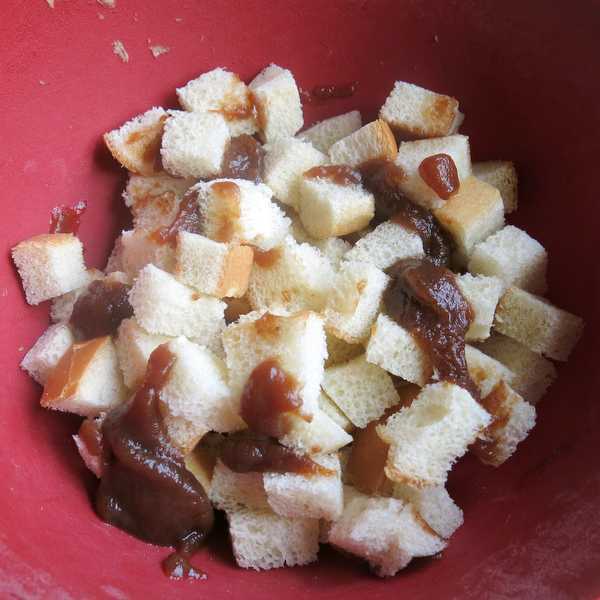 STEP 2 – Cut soft bread into small cubes and drizzle with apple butter. Note that this bread is soft, not stale or dried and not extremely crusty either. Gently toss the bread cubes with a fork so that the apple butter is evenly distributed. Use our recipe for Crock Pot Apple Butter that is lower in sugar or use your favorite brand. 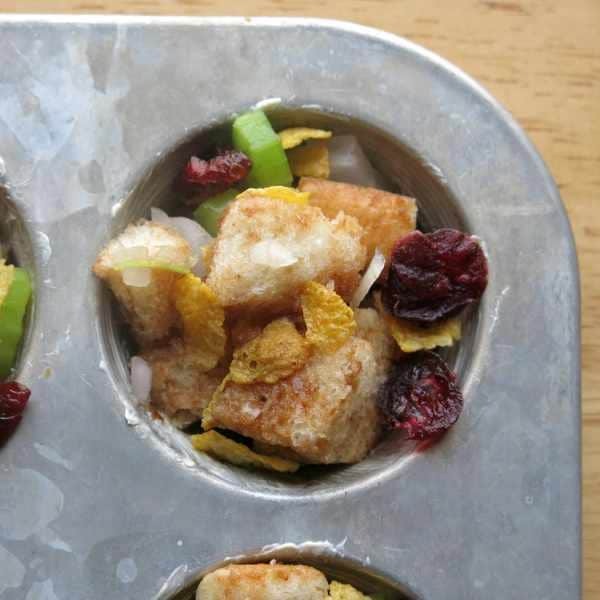 STEP 4 – Stir together the remaining bread cubes, finely diced celery, finely diced onion, crushed corn flakes and dried cranberries. Toss with a fork to combine. No. You don’t need to saute the onions and celery first. They will soften as the muffins bake. Corn flakes? Yes. It’s one of the secret ingredients in our family stuffing recipe and adds a delicious crunch. You can use chopped walnuts or pecans instead though. 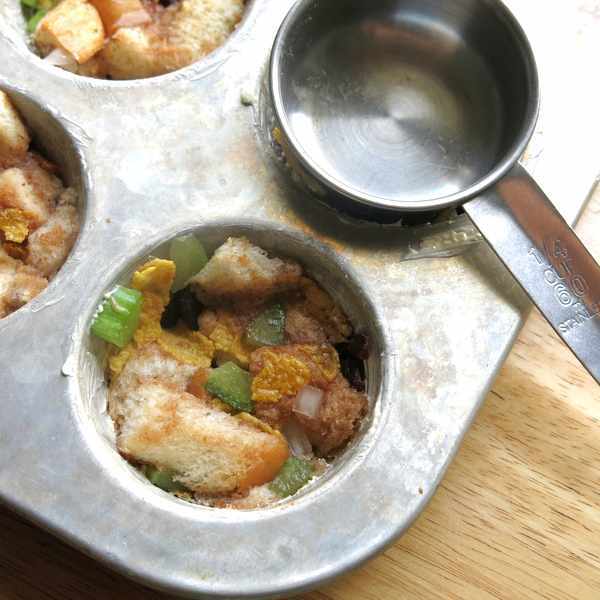 STEP 5 – Spoon more bread cubes and goodies into the muffin tin wells being careful to distribute the ingredients. The vegetables and other goodies will gravitate to the bottom so be sure and dig down to the bottom of the bowl. Each well should be over flowing. STEP 6 – Press the mixture down with a measuring cup, spoon or your hands. The once mounded muffin ingredients should now fill up about half of the muffin tin well. This step is absolutely necessary to make the breading “stick” together during the cooking process. Trust me! STEP 7 – Bake the stuffing muffins in a 375 degree F oven for about 20-25 minutes. The tops should be browned and firm to touch. Allow the muffins to cool in the pan for about 10 minutes and then carefully pop them out with a fork. Serve warm or at room temperature. Prepare this recipe up to 2 days in advance and store in the refrigerator. Wait until the day of serving to bake in the oven. Or, bake at the time of preparation and reheat in the oven or a toaster oven before serving for about 10 minutes. We do not recommend using the microwave. Can you freeze stuffing muffins? Stuffing muffins store very well in the freezer. For best results, wrap individually in plastic wrap. When ready to enjoy, remove them from the freezer to the refrigerator and allow them to defrost overnight. To reheat, remove the muffins from the plastic wrap and warm in a toaster oven for about 10 minutes. Use within 2 months of freezing. 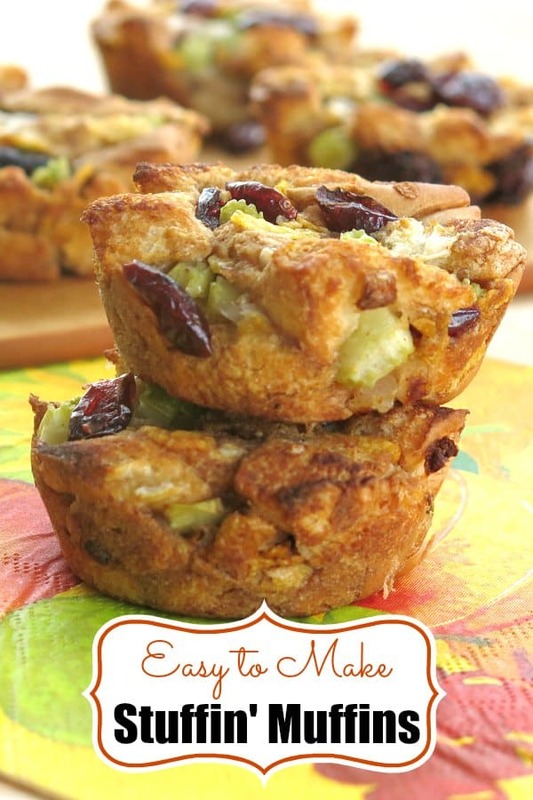 These stuffing muffins are so easy to make…don’t wait for the holidays to enjoy them! 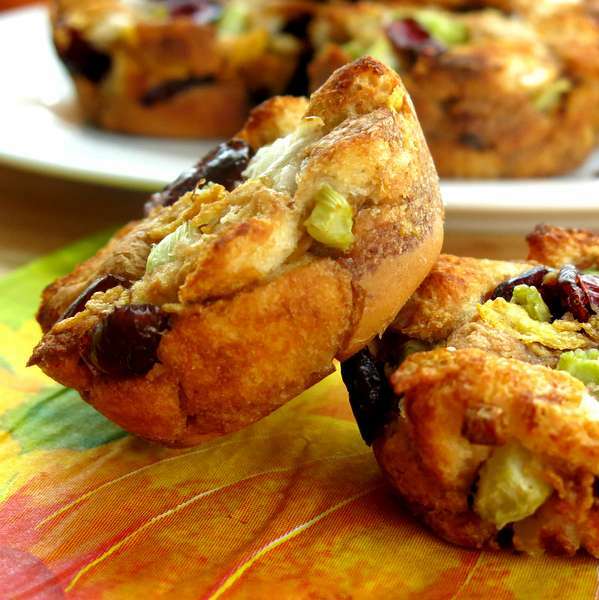 These easy Stuffing Muffins are a perfect side for any meal. With just 6 ingredients and no stove-top prep required, you don't need to wait for the holidays. Generously grease 12 muffin tins with butter. Drizzle apple butter over bread cubes and gently toss with a fork to evenly coat. 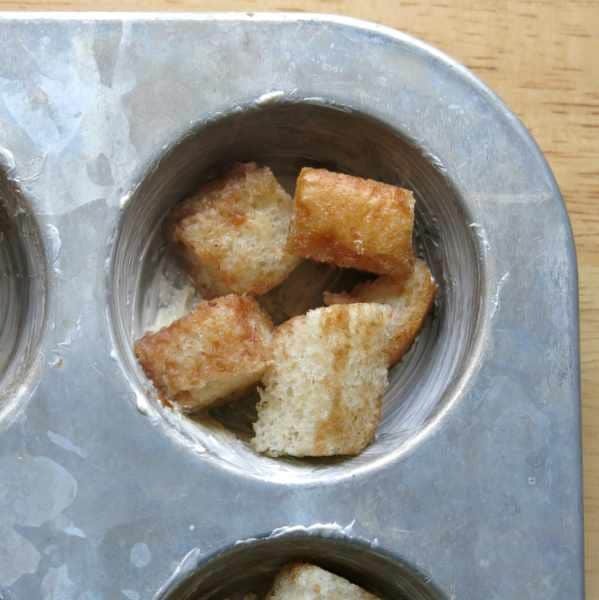 Place 4-5 bread cubes in the bottom of each muffin tin. 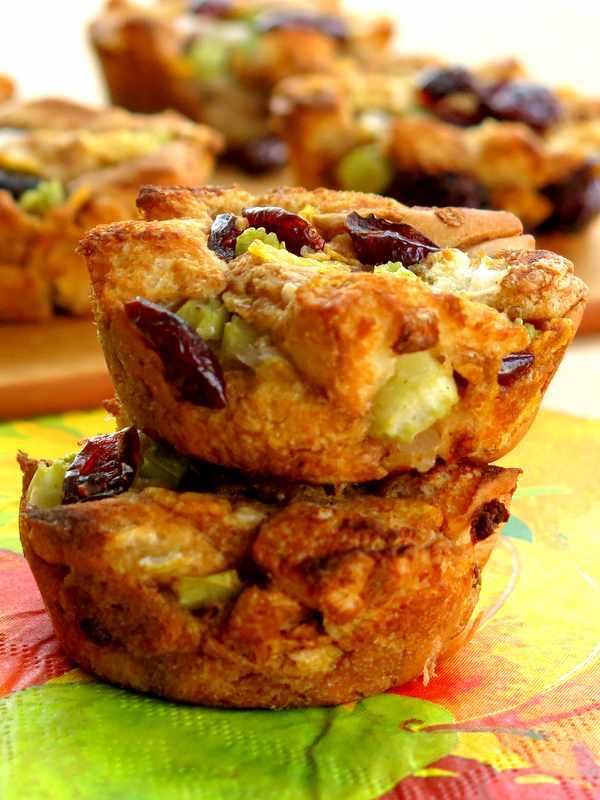 Add celery, onion, corn flakes and dried cranberries (a.k.a goodies) to remaining bread cubes. 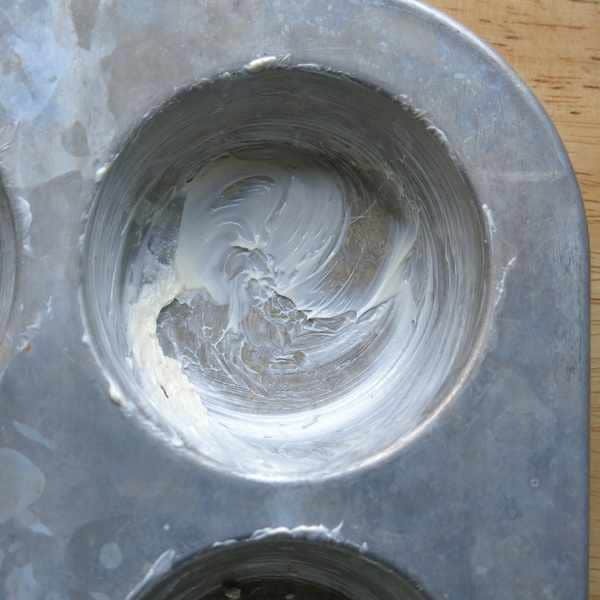 Press the mixture down with the bottom of a measuring cup, spoon or with your hands until the mixture is compact and fills up about half of the muffin tin. Add additional bread cube and goodies mixture to each tin so that it is heaping slightly over the top. Again, press the mixture down so that is compact and just even or slightly over the top of the muffin tin. Bake for 20-25 minutes or until the top is browned and firm. 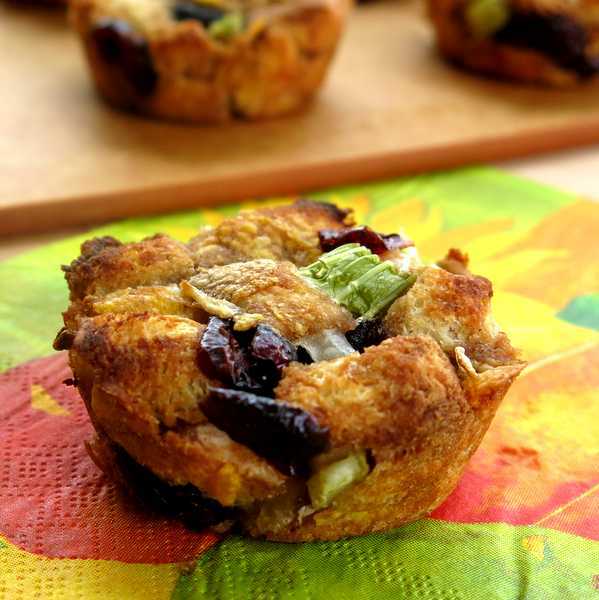 Allow stuffing muffins to cool in the muffin tin for about 5-10 minutes. Gently remove stuffing muffins with a fork. 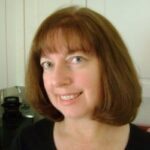 Wow – I would have never thought of this – great idea and perfect size Pinning! Thanks! We have been enjoying these a lot. These are amazing! I also love the step by step pictures. Thanks Marjory! Thanks Betsy! These were fun to make! These were very tasty with raisins. Will make them againb.